We’re one third of the way through NaNoWriMo and I’ve fallen below par. I started the day needing 2539 words to get up to where I need to be, 873 of which were from yesterday. I’m not going to get there today, and will probably end up even further behind because I’m in one of those phases where every word I put down is a struggle. Sometimes there’s just no way to win. Time in my life is… different. I work evening shift (3:00 to 11:00). It’s “morning” until I go to work, and it’s “today” until I go to bed, even if I’m up until four or five o’clock in the morning. I frequently eat my first meal of the day around noon, which means that my breakfast is at lunchtime, my “lunch” comes at suppertime, and “supper” is a midnight snack turned into a meal. And I work every normal weekend, so my “weekends” are Tuesdays and Wednesdays, and my workweek is Thursday through Monday, so Thursday is my Monday and today (Monday) is my Friday. All of this time rambling has come about because one of my goals for this month is to write a thousand words a week. But what’s a week? So I have decided that my “week” for the weekly goals (write a thousand words a week and spend at least an hour a week working on some other craft) will be Thursday through Wednesday. Because, you know, I need another definition of “week” in my life. Meanwhile, it’s lunchtime, so I should go get some breakfast, but I don’t want to disturb my rat. It was strange being home this weekend. Normally I work on weekends and am scrambling to keep up with Rainbow Snippets before I go to work on Saturday, then scrambling to catch up with it and Sunday Snippets when I get home Saturday night – and again Sunday morning and afternoon before work (I work the 3 – 11 shift), and Sunday night after work, and Monday before work… But I was able to stay caught up on both all weekend, and it just feels… weird. And not only did I stay caught up on the blog hops, I also reached the halfway point in making changes to Book Two of The Academy of the Accord. Now that I’m on a roll with it again I’m hoping to finish it in the next couple of days, definitely by the end of the week. Anyhow, if I can get it done by Tuesday there’s a chance that I can get Book Three’s changes entered before I go back to work. At least the weather is going to cooperate and help me out on the editing goal. It was supposed to be in the 40s tomorrow and I was planning on getting out and running some errands (which always takes longer than planned) but now they’re calling for snow starting this evening and devolving into freezing rain through Tuesday afternoon, so I’m thinking it’s going to be a better day to stay inside with lots of hot tea. And, of course, the kitchen still refuses to clean and declutter itself. Friday night I came home from work and found one of my rats had crossed the bridge. Pistol wasn’t big on snuggling – he was far too busy to do that – but he was the personification of mischief and the cage is much quieter without him constantly instigating something. For now, his body is on the back porch in a hanging basket that I had bought for in the cage (he loved hanging baskets) covered in potting soil. In the spring I’ll plant petunias in it; petunias, to me, are such happy, riotous flowers – they completely match his personality. Then, an hour and a half or less into my shift on Saturday, while helping reposition a patient in bed, I lost strength in my left arm and gained pain. Ibuprofen didn’t help, so about two hours later I filled out an employee injury report and turned it in. It kept getting worse so after my shift I picked up a form and went to the ER. Actually, it was cold and foggy and I was going to wait to see if it would miraculously feel better in the morning, but I reached my fingers out to turn on my turn signal and almost put a moon roof in my car, so I stopped at home long enough to drop off my stuff and make sure the boys (my rats) had food and water, then I braved visibility that wasn’t much beyond the hood of my car and drove to the hospital. Drove home in more fog and collapsed into bed around four o’clock in the morning and slept until noon. So, like I said, it’s been a rough few days. Then, yesterday, there was a burst of sunshine. Now, it’s nowhere near ready to be seen by anyone, but she talked me into it so I made a version without all my notes to myself and warned her about it containing grammatical errors, inconsistencies, etc. You know, the usual first draft stuff. She thought it would be fun to see the rough stages of a novel, so I welcomed her to my nightmare and sent the file. I have now been ordered to drop everything else and finish it. But now I’m trying to figure out how I’m going to drop everything and finish and polish Hedge House, finish the revisions on Onyx Sun, and finish Book Six of The Academy of the Accord and Book Two of The Other Mages trilogy – all by the end of the month. Short of winning the lottery so I don’t have to work, I just don’t think it’s going to be possible. And while I’m quite skilled at believing impossible things (before, during, and after breakfast) I’m not quite as skilled at doing them. It’s actually not been too unproductive of a week. I’m a couple pages ahead on the “page a day” challenge and (courtesy of a pan of brownies) I’ve finished the latest round of paper edit on Sanguine – just need to get the changes made in the word doc now. There are still a few rough areas toward the end that I need to spend some time on, and the ending is weak, but it is coming along nicely and now that the rest is pretty much fixed up I can focus on those two or three scenes and the ending. And, in non-writing news, I finally dragged out all my t-shirts and got my sweatshirts put away so I have more than 3 shirts available. 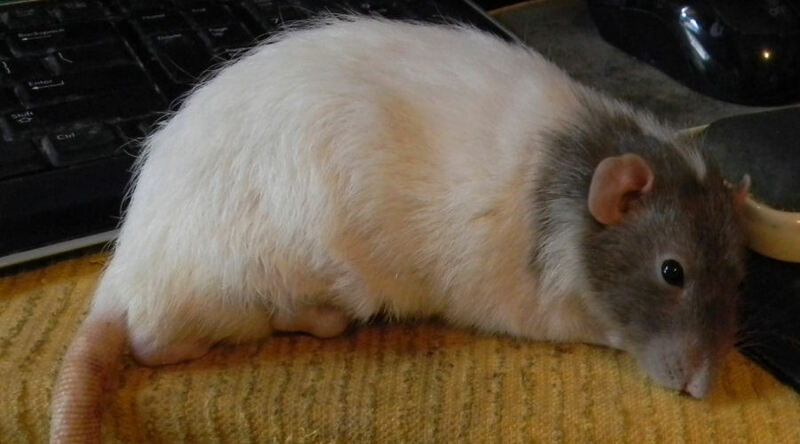 And the rats have learned to love their antibiotic and seem to be feeling better – still some sneezing but no wheezing. I started a blog for them (Rats in the Belfry) just because they are such fun critters. They did leave me a mystery to solve, though – somehow the bottom of their cage got soaked overnight. I would blame a leaking water bottle but the intervening level is dry. Back to work today after three days off. I enjoy hermit-hood way too much.